If trash and residue are ongoing concerns, a heavy harrow could be the solution for you. At Flaman, we provide a selection of Rite Way heavy harrows that are available in multiple sizes and working widths. 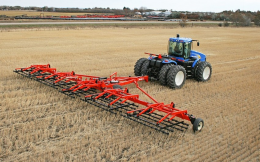 Designed to benefit conventional tilling, minimum-till and zero-till operations, these harrows can handle the layout of your field. The patented Field Transport Pivot Wheel system featured on all harrow models from Rite Way allow you to easily switch from field to transport position. Narrow transport models, with a width of only 9 ½ feet, are also available, providing you a convenient and safe solution to your commute. 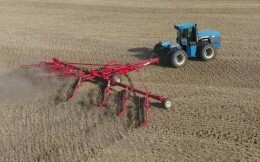 Additional features include hydraulically adjustable tines that can be controlled from the tractor cab, allowing you to manage the aggressiveness of the harrowing, and parallel linkage arms to ensure even wear and equal pressure across all sections. The variety of field prep equipment on the market is endless, and deciding which equipment is best for you can be a tedious task. Flaman’s ag equipment experts, with a combined amount of experience that exceeds 100 years, are here to help you make an informed choice to best suit the needs of your operation. Visit one of our dealerships, located across Alberta, Saskatchewan and Manitoba, to view our selection of harrows, or to learn more about our full line of farm equipment.